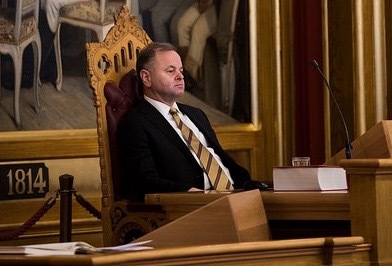 Olemic Thommessen, president of the Norwegian Parliament (Stortinget), was facing more tough questions and heavy criticism this week, after yet another huge budget overrun was revealed in a highly controversial building project his office has led. The entire project is now being called a “complete scandal,” and he’s accused of trying to avoid responsibility. Newspaper Aftenposten was especially merciless in an editorial published on Monday: “The project was poorly planned. It has been badly managed.” The newspaper, Norway’s largest, claimed that any ability to adjust the project underway or inform Members of Parliament about the president’s office’s errors has been absent. “Topping it all is a quarrel over responsibility, which long ago began to resemble a farce,” Aftenposten wrote. Thommessen narrowly survived re-election as the Parliament’s president, a position second only to the monarch’s, last fall. Many were surprised when his Conservative Party’s leader, Prime Minister Erna Solberg, nominated him once again, given all the trouble over the building project and budget overruns even then. The state Auditor General had also already claimed that Thommessen’s office “broke its own rules” in running the project. Now his days may be numbered, after his office was all but forced last week to reveal yet another budget overrun in the project that began with the remodelling of an adjacent office building and garage expansion, and expanded with construction of a new tunnel entrance and postal terminal. It has caused enormous disruption in the neighbourhood south of the Parliament for years. As Aftenposten noted, the project’s initial budget was set at NOK 70 million. Late last week, all the overruns and expensive complications had brought the bill up to NOK 2.3 billion, and it may rise further. “The result is that taxpayers are hit with an enormous extra bill, the Parliament is placed in disrepute and our elected officials appear non-chalant about the taxpayers’ money,” Aftenposten continued. 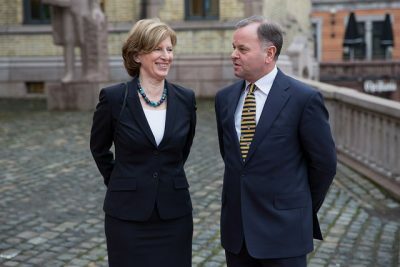 It’s not enough, it argued, that the Parliament’s administrative leader, Ida Børresen, abruptly resigned on Friday, just a few months before she was due to retire anyway. “That’s a minimum reaction, and this is by no means the end of this embarrassing and extremely costly scandal,” Aftenposten wrote, calling her resignation just a step towards placing “necessary responsibility.” It didn’t help when Børresen told newspaper Dagens Næringsliv (DN) over the weekend that “now I can do what I like” after she cleaned out her office at the Parliament this week. “I can watch the Olympics and don’t need to get up so early.” She also said she couldn’t see what else she could have done as the building costs piled up. There weren’t many signs of remorse, perhaps prompting Aftenposten’s comment of “non-chalance” among those in charge. Newspaper Dagsavisen was also calling the ill-fated construction production, for expanded garage facilities and a postal terminal that may not even be needed, “an historic building scandal.” Its chief political commentator and former editor-in-chief Arne Strand wrote that Olemic Thommessen “should have followed” Børresen out the door. Instead, Thommessen believes he still has the confidence of Solberg, and both of them (“incredibly enough,” according to Aftenposten) blame former parliamentary leaders and the consulting firm that Thommessen and Børresen used, Oslo-based Multiconsult. They’ve sued the company, the leaders of which vigorously defend themselves. It’s also been pointed out that the costs of the project have doubled just since Solberg took over government power and chose Thommessen as president of the Parliament. He claims the news of the new NOK 500 million in costs “came as lightning out of a clear sky.” There’s some doubt about that, with Børresen herself telling DN that the project’s accounts indicated as early as last October that the money set aside for the latest budget was running out. Thommessen claimed as late as December 20 that the money was sufficient. That turned out to be wrong. Now the entire “scandal” appears headed back to the Parliament’s own disciplinary and finance committees, with the new leader of the latter (Henrik Asheim of the Conservatives) telling state broadcaster Wednesday morning that the Parliament itself should absorb the costs through its own budget. Since they already amount to more than twice the annual operating budget for the Parliament, however, that seems unrealistic. Thommessen’s days as leader of the construction project itself are at least numbered, after he finally relinquished control of it to the state building agency Statsbygg, which many feel should have had control all along. “We realized that the (president’s office) wasn’t the right leader,” Magne Rommetveit of the Labour Party, who serves as third vice president of the Parliament, told Dagsavisen. He noted that Thommessen’s office has neither the capacity nor the competence to handle projects outside ordinary parliamentary operations. The finance committee will meet next week to decide how to finance the extra NOK 500 million in costs that were revealed last week, with Thommessen due for harsh questioning over the budget overrun. “We have to get to the bottom of how this could happen,” Asheim told Dagsavisen. Kari Elisabeth Kaski, a member of the finance committee for the Socialist Left party (SV), has many questions as well. SV had proposed a lack of confidence vote in Thommessen last year. “We still stand by that now,” Kaski said this week.